New question types and the ability to add embedded videos are a few of the features added to Netop’s Web-based assessment tool, Learning Center in a recent update. Learning Center is a part of the company’s classroom management software Vision Pro, but it is also available separately for use with a related iPad app. It can be used as a student response system or to create quizzes and assessments based on lesson plans and materials posted online. 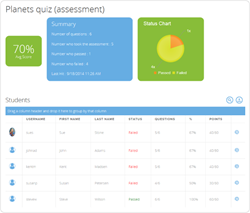 Scores and feedback can be sent automatically to students. According to the company, it is frequently used with blended or online learning programs. As part of the recent update, teachers can embed interactive videos into quizzes and create polls to gauge learning or get feedback on a lesson. The update also streamlines installation and setup for IT staff, allowing them to send user account information automatically to new users. They can also import data into the program from Active Directory. "It is important to us that our tools are effective and easy to use, for teachers and IT staff alike," said Ronny Tovgaard, senior vice president of education for Netop in a statement. "The new features—interactive videos, polls, and surveys—open up new possibilities for student engagement. And from an administrative standpoint, it’s easier than ever to set up and manage."